Cenique is transforming the retail and Digital Out of Home (DOOH) industries by providing valuable insights on the effectiveness of digital signage deployments. In addition to our flagship Video Analytics solution, Cenique provides DIY and SME markets with advanced Android-based media players that include basic playback capability, with options to preconfigure with industry-leading CMS solutions. Cenique’s engineering capabilities include end-to-end solutions, Android OS customization, software and hardware design, as well as cloud-based software development. Cenique is delivering the next generation of Intelligent Digital Signage Solutions, called IntelliSense1.0. All IntelliSense solutions leverage the economical Android platform delivering all of the high performance features for the majority of single screen applications. Plus the advantages of low power, solid-state and integrated connectivity. Best yet, they are delivered pre-loaded with CMS software from leading suppliers for more efficient deployments for resellers and SME customers alike. 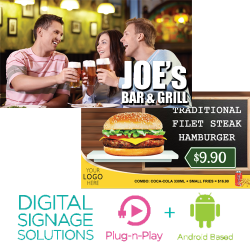 Every solution is also delivered future-proof, pre-configured with IntelliSense Analytics software that will enable you to optimize your content to fully maximize your digital signage ROI.